Image Comics, in my opinion, are pretty much a vehicle for the great writing of Robert Kirkman. The Walking Dead & Invincible - that is what I think of when I think of Image comics. In the last couple of months a new title has arrived that is of such quality that my image of image (sorry) has changed. 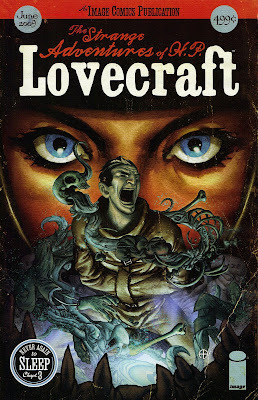 This title, 'The Strange Adventures of HP Lovecraft', is that good that you would mistake it for a Veritgo title. "Pulps are the wastelands. And few writers, if any, will ever rise from their vulgar depths to claim greatness. i've made my peace with that simple fact." The third installment deals with the aftermath of the attack on Grayson Chesser, who is the lover of Syliva St Claire, who is coveted by Lovecraft. 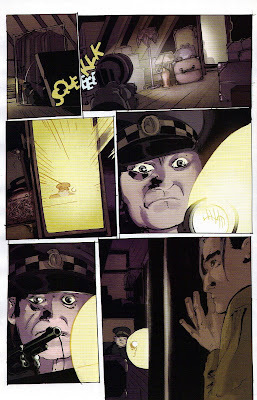 The attack on Chesser was the result of monsters who "have slithered out" from HP Lovecraft's subconscious and murdered 3, and with Chesser, nearly claimed a fourth victim. Verdict. It is a beautiful, wickedly entertaining book. A real achievement, in the story, the art, the way the whole package comes together. Fantastic overall, and issue 3 maintains the high quality of the previous installments. A worthy 9.5 out of 10, but overall for the series so far? 10 out of 10.